TMNT: Shadows of the Past Board Game gets its First Expansion! One radical playable hero add-on for the massively successful TMNT: Shadows of the Past Board game! 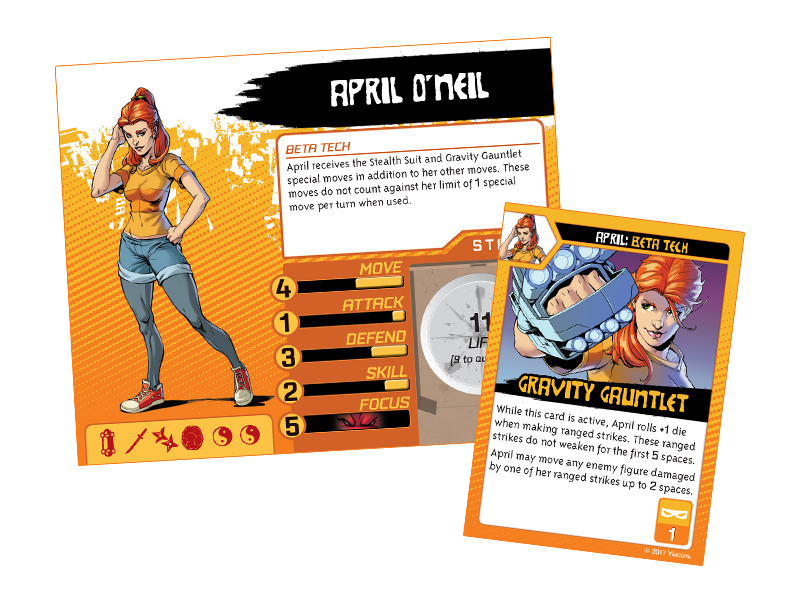 April O’Neil, gutsy and independent ally of the Teenage Mutant Ninja Turtles, is getting a premiere hero pack upgrade from Kevin Wilson, the same creator of the critical hit, TMNT: Shadows of the Past board game. 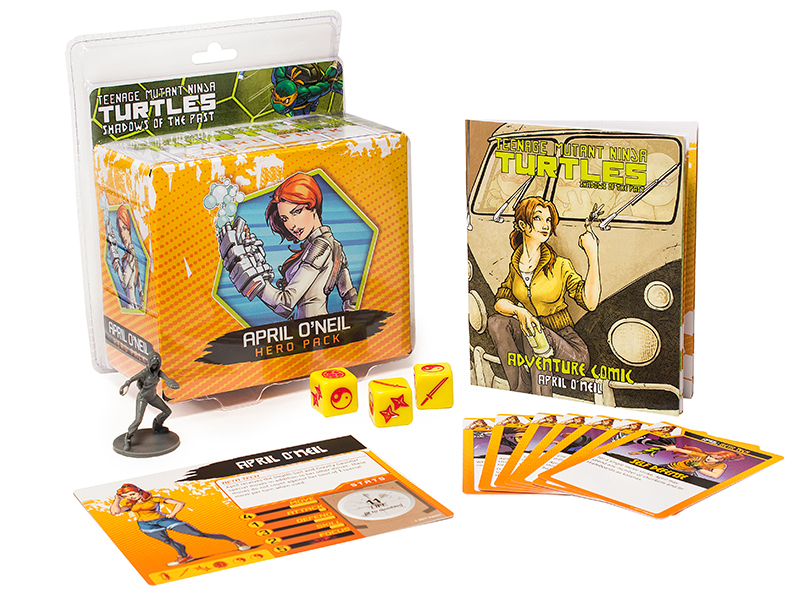 Fans can continue the plot of the original base game, TMNT: Shadows of the Past, with the April O’Neil Hero Pack, which includes an all-new adventure comic featuring four new battle scenarios not available in any previous TMNT box set. The expansion includes April’s action dice, which features a double shuriken and two chi faces, making her a shredded powerhouse long-range fighter. 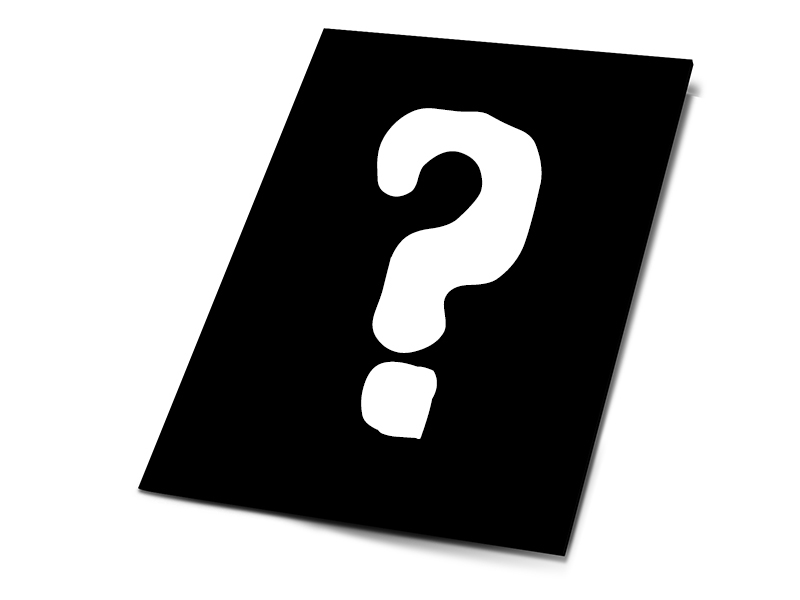 Additionally, the pack includes 7 action cards such as First-Aid, which allows her to heal the Turtles, the boot-shaking Gravity Gauntlet, that both inflicts damage to opponents and knocks them back, and the Stealth Suit, which makes her incredibly hard to hit in combat. Also available in this expansion pack, is a new April O’Neil figure sculpt with a completely different look. With her hood up and gravity gauntlet raised, April is ready to stand up and fight alongside Leonardo, Raphael, Donatello, and Michelangelo. In total, the TMNT: Shadows of the Past Board game expansion: April O’Neil Hero Pack upgrade includes the plastic figure, three Action Dice, seven Action Cards, a Hero Sheet featuring new art from Tony Vargas, and the Adventure Comic with 4 new Battle scenarios. Please note that this pack requires the base game to play. 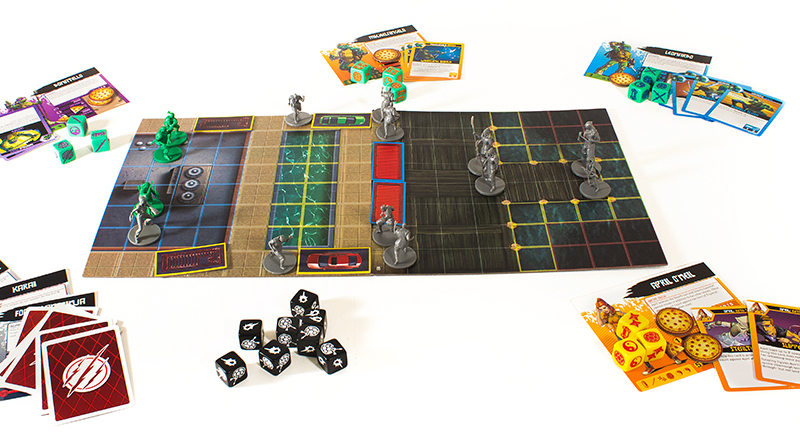 ← IDW GAMES BRINGING TEENAGE MUTANT NINJA TURTLES BOARD GAME TO KICKSTARTER!